Fittingly, a new exhibition on witchcraft opens today at Cornell University. Pulled from the university’s Witchcraft Collection, The World Bewitch’d spans five hundred years of witch-related material: trial documents, religious texts, spells, and even confessions explore a group of people, often women, marginalized and ostracized from society, with the core of the material hailing from Germany and France. The highlight of the show includes the first book on witchcraft ever printed, as well as handwritten transcripts from European witchcraft trials. Throughout history, witches were often portrayed as either ugly old hags or as alluring seductresses, and the show explores how that view has changed--or not--with the passage of time. “This collection has profound repercussions on today’s world, where persecution of the defenseless is alive and well,” said exhibition co-curator Anne Kenney. The collection was once part of the personal archives of Cornell co-founder Andrew Dickson White and is believed to be one of the largest collections on witchcraft in North America. The opening reception is today from 4:00-5:30 at the Kroch Library on level 2B. The World Bewitch’d will remain on display through August 31, 2018. 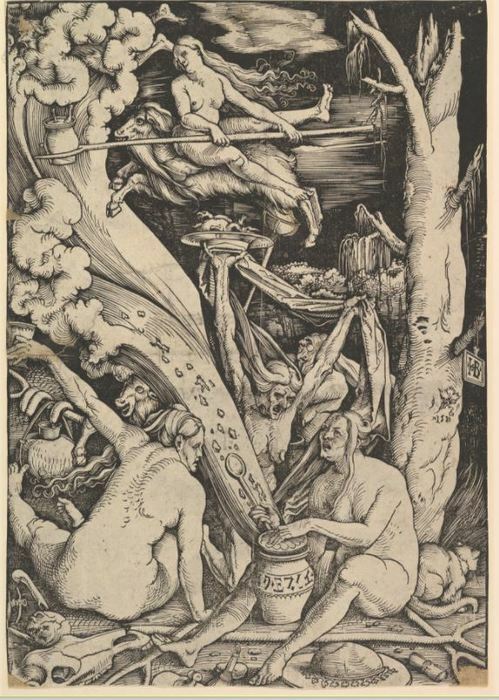 Image: “The Witches,” by Hans Baldung (1510). Woodcut. Public Domain, courtsey of the Met Museum. Fittingly, a new exhibition on witchcraft opens today at Cornell University. Pulled from the university's Witchcraft Collection, The World Bewitch'd spans five hundred years of witch-related material: trial documents, religious texts, spells, and even confessions explore a group of people, often women, marginalized and ostracized from society, with the core of the material hailing from Germany and France. The highlight of the show includes the first book on witchcraft ever printed, as well as handwritten transcripts from European witchcraft trials. Throughout history, witches were often portrayed as either ugly old hags or as alluring seductresses, and the show explores how that view has changed--or not--with the passage of time. "This collection has profound repercussions on today's world, where persecution of the defenseless is alive and well," said exhibition co-curator Anne Kenney. The collection was once part of the personal archives of Cornell co-founder Andrew Dickson White and is believed to be one of the largest collections on witchcraft in North America. The opening reception is today from 4:00-5:30 at the Kroch Library on level 2B. The World Bewitch'd will remain on display through August 31, 2018. Image: "The Witches," by Hans Baldung (1510). Woodcut. Public Domain, courtsey of the Met Museum.